You a big Solitaire buff are you? You’ll be glad you picked up 10-in-one Spider Solitaire for your iPad. 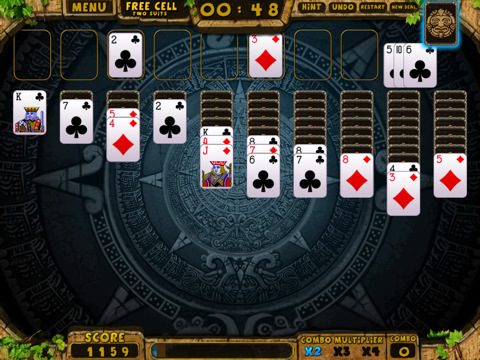 This four dollar iPad app is a collection of classic windows style solitaire games with a nifty ruins style graphical interface and catchy tribal background sounds. Spider Solitaire is basically a combination platter of Solitaire games including free cell, spider, tarantula, and black with one, two and four suit play modes. Rack up your cards and geek out in style. Plays smoothly on the iPad and is fun to look at as well. Playing gives you a few options like support for both portrait and landscape orientations, hints, customizable playing cards and color themes, OpenFeint support and more. The bases are also covered with scoring, undo, restart and new deal. If you appreciate the Aztec arts, you’ll love the graphics in here. The card sound effects are crisp and the cards themselves are very legible although I would love if there were some more options as far as how they are represented. If you don’t know how to play all the games included in the app, you’ll have to go searching for instructions on your own since imohoo unfortunately hasn’t included any in the app. The only other issue I have with the app is the price, which might be a tad bit too high for the casual iPad gamer looking for a solitaire pack. Overall, a solid effort that can only get better from here. AppSafari review of 10-in-one Spider Solitaire was written by Joe Seifi on July 26th, 2010 and categorized under App Store, Games, iPad apps, Puzzler. Page viewed 5888 times, 2 so far today. Need help on using these apps? Please read the Help Page.